The Calore River (n.4, right) starts at about 1660 m (c. 5500 feet) near the town of Montella in the Picentini mountain subrange of the Appenines above Salerno. It flows north to Benevento then turns and flows into the Volturno after a course of 108 km (130 miles); it is the largest tributary of the Volturno. The Calore is traditionally divided in upper, central and lower; during its run to Benevento and then on to join the Volturno, it picks up a number of tributaries, the largest of which are the Tamarro and the Sabato rivers. It has a large basin and substantial flow and can be given to flooding, which has happened near Benevento. Conversely, in summer the river can almost run dry due to the large-scale use of its waters for irrigation. The name "calore" means "heat." It is not certain whether that has to do with the relatively high temperature of the water, such that in ancient times the river was treated almost as a thermal spa, or whether the name is simply from the Oscan word for river. There are two other, smaller rivers named the "Calore" in the Campania region of Italy. 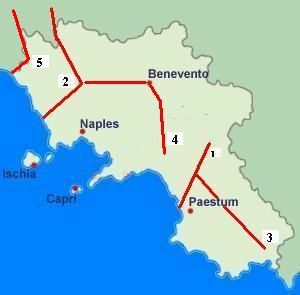 One flows into the Tanagro (approximately near the numeral 3 in the map); the other joins the Sele river at a point above Paestum. The strategic position of Benevento and the Calore valley made the area the site of a number of important military actions. In 275 BC it was the site of the battle that gave us the term Pyrrhic victory, in which Pyrrhus of Epirus fought the Romans to a very costly draw and then withdrew to Greece, leaving the Italian peninsula solidly in the hands of the future empire builders. Almost a thousand years later, it was also near here in 663 AD that the Eastern emperor Constans II tried to reestablish Byzantine sovereignty in southern Italy a century after the Lombard invasions had dislodged the Greek forces of Justinian the Great. That attempt failed and Greece was never again a force in the south. Finally, the last famous "Battle of Benevento" was the one in 1266 in which Manfred of Svevia (Hohenstaufen), the natural son and heir to Fredrick II, was killed, opening the way for the Angevin take-over of the south.